Hello Monica M here with 3 cards to share today. I got a little stamp happy in the craft room. I’m in the Christmas mood and still a lot of cards to finish so I can get them mailed out! I was hoping to have my cards almost done before now… I do this to myself almost every year. I’m a procrastinator and mom of 3 boys, one of which has his first job sooo… Any who… on to the cards. I started by masking the area I wanted to stamp to create my own stamped panel. Once the background was complete, I stamped my image in a darker color so that the words wouldn’t be seen through the image. I had to let the dark ink dry a little since I stamped the image multiple times to make sure it was opaque. Once the ink was dry I used VersaMark so that I could emboss the images using the White Satin Pearl powder. I repeated the steps to create a trio of cards, changing the color and themes slightly. I loved how simple this was, and helped to get three cards done relatively quick. I think it took about an hour and that includes the time it took me to decide on which sentiments, images, and colors to use. Are you on social media? We are! Please join us on Twitter, Instagram and Facebook? so you don’t miss any fun promotions or new challenge announcements! The a2z scrapbooking store carries a wide variety of Hero Arts products! Get discounted new releases, sales, grab bags & more. Proceeds from our store benefit Celiac & Behcets disease foundations. Use my discount code Monica15 to get 15% off your purchase of $25 or more. If you’re looking for a Hero Arts product you don’t see in store, use the Request Custom Order button from with-in the shop. Categories: Challenges, Christmas, Clean and Simple, Embossing, Handmade Cards, Hero Arts, One Layer | Tags: Challenges, Christmas Cards, Monica, One Layer Cards | Permalink. Today I’m sharing 2 cards I made. I am on the hospitality committee for the PTA at my boys school. We provide a meal once a month for the staff and like to celebrate the staff birthdays too. I’m in charge of making the cards and someone else brings the birthday treats. We only have 2 birthdays this month, but I still kept it super simple. I stamped the images on both cards then colored. I used the same yellow, green and brown shades on both cards. Adding pink and purple for a more feminine feel on one and keeping the other in more primary tones.I also traced the birthday sentiment in a pink glitter pen for a little sparkle. There is still plenty of time to join our stencil challenge this month for a chance to win! If you’ve messed our special incentive this month, we are also offering a gift card for the blog comments! You will be entered for each days comment you leave and we will have a random drawing for our luck winner! If you are in need of any items from the a2z Scrapbooking store you can use code Monica15 at checkout to receive 15% off your purchase of $25 or more. (before tax and shipping) And don’t forget that we are on Twitter, Instagram and Facebook. Follow us on these different social media outlets so you won’t miss out on any fun promotions! Categories: Birthday, Clean and Simple, Handmade Cards, Hero Arts, One Layer | Tags: happy birthday, Hero Arts, One Layer Cards | Permalink. Looking for the Giveaway for the Coffee Lovers Blog Hop?! Click here on the link and then comment on the rafflecopter link at the very bottom! Hi! It’s Sue and I’m here with a one layer card. Are you like me, I’m really intimidated by one layer cards. I seem to like to mess up the card on the very last stamp impression – like it doesn’t stamp properly, I smudge it, I leave a partial inked fingerprint somewhere. You get the idea, right? I like the option of trimming down the stamped panel if I do mess up a bit. However, on a one layer card, one just doesn’t have that option. Yes, I know, it’s only a paper – you should see my recycle bin! I drew really faint pencil marks to demarcate the area I wanted to focus on. I used Hero Arts Spring Hello with Lia stamp set with a variety of Hero Arts inks. The sentiment is from the same stamp set. I used a thin black marker to add a frame. To participate, your focal image needs to be a Hero Arts product. How would you like a 15% discount off of purchases of more than $25 at a2z Scrapbooking store? Use my code Sue15 for that 15% discount. Categories: Clean and Simple, Flowers, One Layer, Thank You Cards | Tags: clean and simple, Flowers, One Layer Cards | Permalink. I am back sharing a CAS one layer card today. Ink the detail stamp of the larger fish from the Hero Arts Color Layering Goldfish set using the darkest shade of the Hero Arts Ombre Ink – Light to Dark Purple on white card base. Ink the solid stamp of the matching fish using the Hero Arts Ombre Ink – Pink to Red. Stamp the head detail with Memento Dye Ink – Tuxedo Black. Mask fish. Use a scallope border scrap, place it at half inch interval and sponge Ranger Distress Ink – Broken China and Chipped Sapphire alternately to create the waves. Stamp bubble in Chipped Sapphire. Stamp sentiment once in Broken China, then in Chipped Sapphire a little offset to create shadow. Use a black glaze pen to intensify the fish eye. Add Stickles – Diamond onto the fish body and Sprinkled Sugar on the bubbles. a2z’s May challenge theme is CAS. Just click the Current Montly Challenge tab on top of the page or this link to get all the details. Not sure about the rules? No problem, click the Challenge Rules tab or this link. You like the supplies I used on my card, they are available in the store. Use code Cindy15 at check out to obtain15% off your purchase of $25 or more (excluding shipping). Remember to follow us on Twitter, Instagram and Facebook if you have not already done so. You don’t want to miss out on any future promotion! Categories: Clean and Simple, Friendship Cards, Hero Arts, One Layer | Tags: a2z Scrapbooking, birthday cards, Color Layering Goldfish, Hero Arts, One Layer Cards, Pink | Permalink. Hello everyone!! I’m jumping in here to announce the winner for our One Layer Challenge!! Check out all of that Christmas Ornament!! Vicki you did a fabulous job on this one layer card!! Congratulations you won a $25 Gift Certificate to the a2z Scrapbooking Store!! Winners please email a2zscrapbooking@comcast.net to claim your badges/prize. Please add “November Winner” in your email, thank you! Congratulations to all of you. Categories: Challenge Winners | Tags: november, One Layer Cards, winners | Permalink. Hello dear friends, I hope you enjoyed your Black Friday so let me show you my cute Christmas Card. I made this using the Lil Hoot Stamp Set. This is not a Christmas set but you can use it in all your themed projects. I used Sahara Sand card stock for the entire card. With sponge daubers and white craft or pigment ink I created the background over the second layer, I didn’t need any stencil, I just inked the dauber and stamped directly over the paper. I tied a loop of red and cream striped ribbon to give the Christmas touch to the card and then I stamped the sentiment using Memento Tuxedo Black Ink. I inked a piece of paper with different soft colors of ink, then I stamped the elephant image with Memento Tuxedo Ink and with color pencils I enhanced some parts of the colors to give more dimension. I fussy cut my image with scissors and pasted over the ribbon and layer using double foam tape. Now it’s time to think about participating in our November challenge, you can see all the inspiration here and you will have the opportunity to win a $25 gift certificate from a2z Scrapbooking Store. And if you use my discount code you can get the 15% off in your order of $25 or more!. Categories: Christmas, Clean and Simple, Coloring, Friendship Cards, Handmade Cards | Tags: a2z Scrapbooking, Cards, Challenges, Christmas, Christmas Card, clean and simple, Copic Coloring, Friendship Cards, Martha Lucia Gomez, One Layer Cards, stamping | Permalink. Warm Wishes to You and Yours!! Looking for our Black Friday Sale post? Go here to save! It’s Lisa here today and I am currently out in lovely San Diego, California where we happily will be spending Thanksgiving with both of my sons, for the first time in four years. I am delighted that my younger son, Alex, and his wife Acacia were able to make the trip with us and we were all so happy to be here and are very much looking forward to a wonderful day together tomorrow. I hope you all have a wonderful Holiday and savor every minute you can with your family and friends. I’d like to send out “Warm Wishes” to all of you and to all the members of the a2z Scrapbooking Group. I’m so honored and very proud to be a part of this team and totally enjoy all of you and your friendships very much. This year I am especially “Thankful” to each and every one of you has been so kind, caring and supportive to me as I continue in this my battle to beat Cancer. I’m so happy to currently be in a “Remission” state and am continuing with treatments to keep me cancer free! Hopefully, forever! 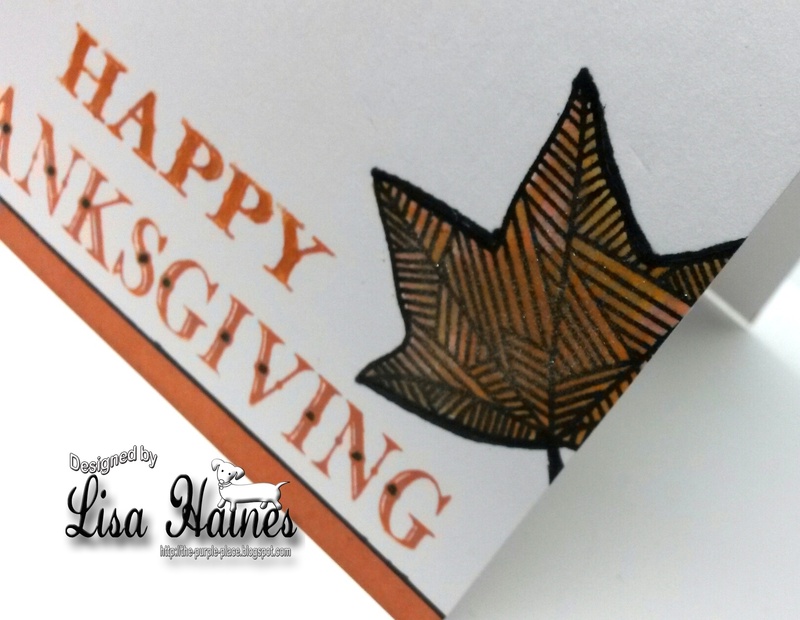 Today I am sharing a sweet little “One Layer Card” done in a Thanksgiving theme that created not only to Wish you a Very Happy Thanksgiving, but to also inspire you to play in our November Challenge this month. All of the supplies if used for this card are shown below in the Inlinkz List. I’m also delighted to give a shout out to Kelly LaTevola, one of our former DT Members and a dear friend, who showed me a great way to add the look of layers/border to a One Layer Card, as shown in her Video HERE! You rock Kelly, and I think this idea is awesome, which is why I wanted to share it with everyone here!! As you can see I used Kelly’s inspiration to add a border to both the top and bottom on my card and love how it gave it a whole new look! Thanks Kelly, this idea is fantastic and one I know I’ll sure over and over again, whenever I make One Layer Cards. A list of the products I used on my card, is shown below with Links to the a2z Store. If you find an item is now out of stock, for there are more goodies you would like to order, please do not hesitate to ask.. We love Custom Orders and are always happy to order for you! Just send us a message on Etsy and we’ll be happy to do so! You can also always us my DT Promo code which will save you 15% off any an ALL order of $25 and up (excluding shipping). Be sure to enter LISAH15 in the promo code box during the check out process! Thanks again for shopping with use, thanks for playing in our challenges and thanks so much for being a friend ! Once again, I hope you ALL have a fantastic Holiday and that you and yours remain very Happy and Healthy for the rest of 2015. Having the chance to spend this year with both my boys has been a special “gift” to me makes me one very Happy Momma – I could not feel more lucky or blessed! I am so Thankful to have this day together and know I’ll cherish it for a long time! 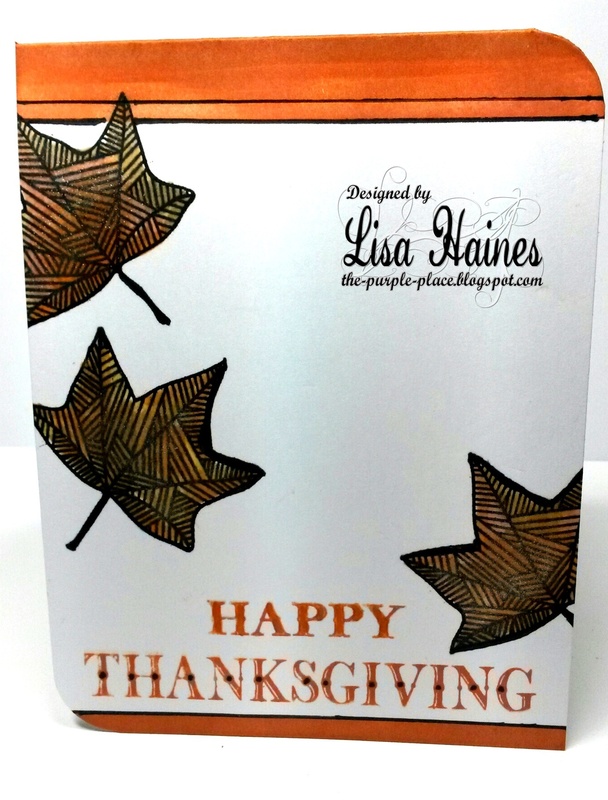 Categories: Challenges, Handmade Cards | Tags: Borders, Inking, Lisa Haines, November 2105, One Layer Cards, Thanksgiving | Permalink. Our challenge this month is all about One Layer Holiday Cards!! Please be sure that your project contains at least ONE main HERO ART Product! For my card I used different elements from the Instant Download Hero Arts Tree-Mendus Digital Kit . It made for a fun and easy one layer card. I hope you will be inspired enough to join this great challenge. Go HERE for all the info. And don’t forget that we are on Twitter, Instagram and Facebook. Follow us on these different social media outlets so you won’t miss out on any fun promotions! 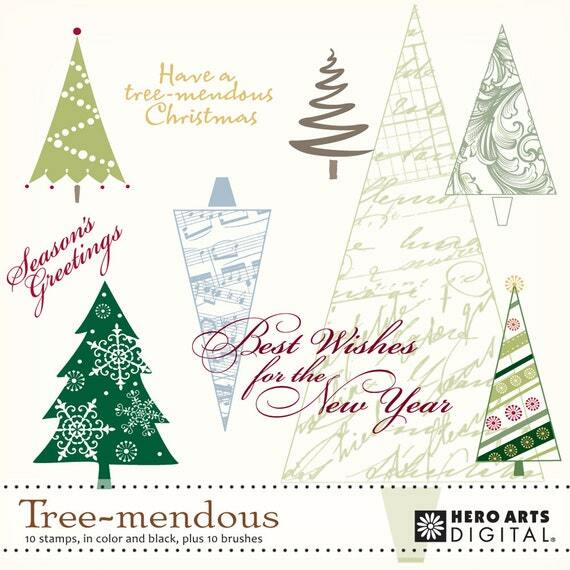 Categories: Digital | Tags: Christmas Cards, digital kit, Michele Cunningham, One Layer Cards | Permalink. An ornament out of ornaments! I simply created a circle mask to stay inside of my desired lines and then went to town stamping ornaments, stars, and polka dots from several different stamp sets. I love the non-traditional colors of blues and greens. A bit of shimmer, some rounded corners, and this card was all set. I do hope I’ve inspired you to stretch your tiny stamps and join in our November One Layer Challenge. Supplies used: Hero Arts Family and Friends, Hero Arts Under the Mistletoe, Soft Navy Shadow Ink, Soft Pool Shadow Ink, Green Hills Shadow Ink, and Lime Green Shadow Ink. Nearly all of the supplies I used are available in the a2z Scrapbooking shop – if something is missing, just hit ‘request a custom order’ and they’ll hook you up! Be sure to use coupon code JENNIFER15 to save 15% on your purchase of $25 or more while you’re there, and don’t forget that we are on Twitter, Instagram and Facebook. Follow us on these different social media outlets so you won’t miss out on any fun promotions! Before I go, we at a2z Scrapbooking wish to extend our thoughts and prayers to our friends in France. À tous nos clients français, nous voulons partager nos sentiments les plus sincère suite à cette tragédie insensée. Tous nos pensés sont avec le peuple français dans ces moments difficiles. Categories: Handmade Cards | Tags: Christmas, Jennifer, One Layer Cards | Permalink. If you are anything like me, I’ll bet you are always making some kind of notes or “To Do Lists” to keep track of everything you need to accomplish. I find that my lists get bigger and bigger as we get closer to the Holiday or other special events. I have the wonderful new array of “Planner Products” created by Kelly Purkey for Hero Arts, I’m super excited to share just one idea I came up with using some of my favorite new products. I thought it would be fun to create a little card that I could put on my fridge to remind me of somethings I need to pick up the grocery store to get ready for some holiday baking. Kelly has the cutest stamps with a whole new collection, just released. You find them HERE over at the a2z Scrapbooking Store. I have also included a Inlinkz list below that will link you to all the Hero products that I used to create my card. Don’t forget to check out all the other Design Team posts and wonderful inspiration cards that have provided to encourage your to plan in our Current Challenge. Our theme for “November” is – “One Layer Cards” and/or “Holiday Cards”. Please be sure to use at least ONE Main “Hero Arts Product” (Stamp/ Die set/Stencil) etc. on your project so that you will be eligible to win our Monthly prize which is a $25.00 Gift Card to the store. You can also feel free to use my DT Promo Code “LisaH15” which will save you 15% off ANY and ALL orders of $25 and up – (Excluding Shipping). Please be sure to enter the Code during the Check out process. If you are looking for something special and can to find it in the store, PLEASE send us a CONVO on Etsy or simply put in a CUSTOM ORDER. We will be happy to place an order with Hero for you and ship it off, as soon as it arrives. Thank you! You can also find us on the the popular Social Media sites — We are one Facebook, Instagram and Twitter and we welcome new Followers! You and find links to each below! Hoping you are enjoying Fall and getting ready for the Holiday…it’s had to believe that Thanksgiving is only two weeks away….where does the time go? 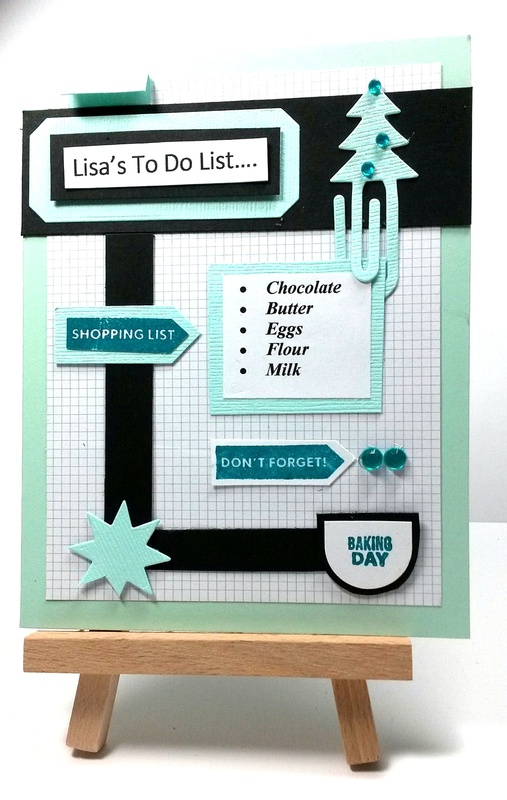 Categories: Challenges, Handmade Cards | Tags: Kelly Purkey, Lisa Haines, One Layer Cards, Planner, To Do List | Permalink. Subscribe to our newsletter to keep informed of new releases, sales, and special events! CLICK HERE to subscribe. Shaker on a scrapbooking page!